Honda has passed on the GST benefits to its customers and prices for its two-wheelers have dropped between Rs 300 and Rs 700 depending on the state of purchase. The Honda Livo is the Japanese bikemaker's attempt to add some jazz in the rather dull commuter segment. The Honda Livo has been positioned as a premium commuter while the Honda Dream series are marketed as affordable commuter motorcycles. Honda is known for its conservative styling but that isn’t the case with the Livo as it gets sharp lines to make it stand apart. The chiselled tank with extensions and the trapezoidal headlamp give the Livo a modern look. So impressed were Honda with the design of the Livo that they didn’t even add any graphics to the 110cc motorcycle. But the simple looking clocks feel out of space on an otherwise well executed motorcycle. The Honda Livo is offered in two variants with the base priced at Rs 53,743 and the disc brake variant at Rs 56,246 (both prices are ex-showroom, Delhi). Honda Livo prices start at Rs. 57,858 (Ex-Showroom). Honda Livo is available in 2 variants and 5 colours. Share your experiences with Livo? The claimed ARAI mileage for the Honda Livo petrol is 74 kmpl. With its sharp lines, the Honda Livo does stand apart in the mundane looking commuter segment. The reliability associated with the Honda brand and the mileage are its trump cards but pricing is steep compared to rivals. Gloamour is definitely better then livo..
Obvioisly glamour..but livo gives more millage. Where in glamour one can get more power and better styling. Q. Does Honda Livo in drum brake have graphics? Q. I am looking for Livo, shall it good decision for me? Q. Which is best between Honda Livo and Dream Yuga in terms of mileage and stylish look? Q. My height is 163 cm, Livo is good for me or not? The newly launched 2016 TVS Victor takes on our king of the commuter class of 2015, the Honda Livo. Will we see a regime? Honda Livo is a commuter with sharp, sporty features. At the front, it gets a stylish new headlamp, a black windscreen on top of it with fin-like air-ducts on the side. The curved fuel tank gets an aggressive shroud that extends into the long and sleek saddle. A grabrail on top of a compact taillight finish the look of the bike. While the bike looks appealing, the instrument console comprises of two rather odd looking hexagonal shaped analogue units. The Livo is available in six colours: black, white, brown, blue, red and grey. The single-cylinder, 109.19cc, air-cooled engine produces 8.3PS at 7,500rpm and 8.6Nm at 5,500rpm, mated to a 4-speed gearbox. For suspension, it uses telescopic forks at the front and adjustable dual shock absorbers at the rear. For braking, the commuter employs 130mm drum brakes at the front and rear. You can also choose to get a 240mm disc at the front. The bike gets 18-inch wheels shod in tubeless tyres. The Livo returns a claimed mileage of 70kmpl with a fuel tank capacity of 8.5 litres and reaches a top speed of 86kmph. The bike is extremely light and the disc variant stands at a kerb weight of 111kgs. TVS Victor: The TVS Victor is TVS' rather premium offering in the commuter range. It comes with a 109.7cc engine that churns out 9.6PS of power and 9.4Nm of torque. It offers a slightly better mileage than the Livo at 72kmpl (claimed). The bike gets a drum brake at the front and a 240mm disc at the rear. The Victor offers a front disc brake as an optional extra. Hero Splendour iSmart 110: The Hero commuter too gets a 109cc engine that puts out 9.5PS of power and 9Nm of torque. 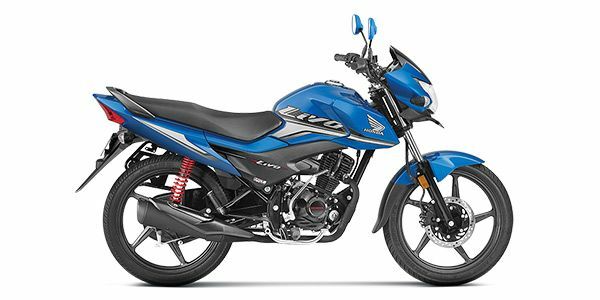 It looks and rides a lot like the Livo and since Hero is a more prominent name in the motorcycle market than Honda, it is a fit rival for the same. However, the mileage on offer is low at 61kmpl. The Honda Livo is a good entry-level option for youngsters with its sporty looks, good mileage and decent pricing. It can also do well in towns that require long distance travelling from place to place. The bike is BS-IV compliant and gets features like Automatic Headlight On, along with a low-maintenance battery and filter. However, optional ABS could have been a plus on the bike.